"DSi" redirects here. For other uses, see DSI (disambiguation). This article is about the second and third revisions of the Nintendo DS. For the first revision, see Nintendo DS Lite. For the entire series, see Nintendo DS family. The Nintendo DSi[cn 1] is a dual-screen handheld game console released by Nintendo. The console launched in Japan on November 1, 2008, and worldwide beginning in April 2009. It is the third iteration of the Nintendo DS, and its primary market rival is Sony's PlayStation Portable (PSP). The fourth iteration, entitled Nintendo DSi XL, is a larger model that launched in Japan on November 21, 2009, and worldwide beginning in March 2010. Development of the DSi began in late 2006, and the handheld was unveiled during an October 2008 Nintendo conference in Tokyo. Consumer demand convinced Nintendo to produce a slimmer handheld with larger screens than the DS Lite. Consequently, Nintendo removed the Game Boy Advance (GBA) cartridge slot to improve portability without sacrificing durability. The Nintendo DSi in black with the Nintendo DSi XL in burgundy. While the DSi's design is similar to that of the DS Lite, it features two digital cameras, supports internal and external content storage, and connects to an online store called the Nintendo DSi Shop. Nintendo stated that families often share DS and DS Lite consoles. Its new functionality was intended to facilitate personalization, so as to encourage each member of a household to purchase a DSi. The handheld supports exclusive physical media in addition to DS games with DSi-specific features and standard DS titles. The only exception to its backward compatibility are earlier DS games that required the GBA slot. Nintendo had sold over 41 million DSi and DSi XL units combined. Reviews of the Nintendo DSi were generally positive; although IGN and bit-tech decried the console's lack of exclusive software and removal of the GBA cartridge slot, its added functionality caused many journalists to recommend it to those who had not purchased a previous DS model. Numerous critics were disappointed with the limited resolution of DSi's cameras, though others such as Ars Technica and GameSpot agreed they were adequate for the handheld's display. CNET and PCWorld considered the DSi Shop to be the most important buying incentive for current DS owners. Some critics believed the DSi XL was not an essential upgrade. GamePro and Wired UK, on the other hand, praised the DSi XL's larger screens for improving the gaming experience and revitalizing older DS games. 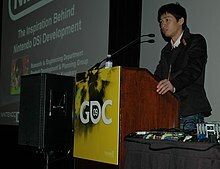 Kuwahara discussed DSi's creation at the 2009 Game Developers Conference. Development of the Nintendo DSi started at the end of 2006. It was the first time Masato Kuwahara of Nintendo's Development Engineering Department served as a hardware project leader. Work went at a quick pace to meet deadlines; his team had to devise a theme for the new DS in time for a late December presentation, and by February 2007, most specifications for a chipset had to be completed. Kuwahara reported that his team had difficulty determining the potential market for the handheld during the design process; he said of their goal, "We have to be able to sell the console on its own [without games at launch]. It also has to be able to meld into the already-existing DS market." The console's digital cameras were considered early in development: Nintendo president and Chief Executive Officer Satoru Iwata described the touchscreen as the Nintendo DS's sense of touch, and the microphone as its "ears"; a co-worker suggested that it should have "eyes". Kuwahara's team originally wanted one camera with a swivel mechanism, but this was abandoned due to concerns of reliability, cost, and the need of a thicker console. Owing to consumer demand, Nintendo also improved the handhelds' volume and audio quality and made it slimmer with larger screens compared to the Nintendo DS Lite. However, to improve portability without sacrificing durability, the GBA cartridge slot present on earlier models was removed. To compensate, Nintendo continued to support the DS Lite as long as there was consumer demand for it. "I made the presentation [...] then at the end asked everyone if this was a game system they would want to own. The result was three to seven. Three people wanted it, seven didn't. And I imagine that since one of the designers was standing right there in front of them, some of them held back their true opinion. In truth, it was probably more like one to nine. It was as bad as I had feared." — Kuwahara on Nintendo EAD's reaction to the original DSi designs. The DSi's size was changed midway through development, delaying its release. Its original design included two DS game card slots, because of demand from both fan communities and Nintendo employees, which consequently made it larger. When the console's designs were unveiled to Nintendo Entertainment Analysis and Development producers in October 2007, it was met with lukewarm reception due to its size. However, Iwata and Kuwahara's own hopes resulted in the creation of a prototype. A quick hands-on investigation led them to abandon the dual-slot design, which made the DSi approximately 0.12 inches (3 mm) slimmer. Ever since the handheld's in-company unveiling, its internal designs were finished along with assembly and durability specifications. Iwata described having to resize the console so close to manufacturing as being essentially the same as making another handheld. Yui Ehara, designer of the DS Lite and DSi's original casing, had to redesign the revised case. He advocated changing the six speaker apertures, as their circular perforations were redundant to the rest of the handheld's interface. He believed that this alteration also signaled a clearer distinction between the DSi and its predecessors while keeping the unit "neat" and "simple". Ehara hoped the DSi's added features would not interfere with his desired iconic image of the Nintendo DS product line: two rectangles, one on top of the other, with each half containing another rectangle inside. This model was publicly revealed at the October 2008 Nintendo Conference in Tokyo, along with its Japanese price and release date. While the DS product line's worldwide yearly sales figures consistently surpassed those of its primary market rival, Sony's PlayStation Portable, demand for it in Japan was decreasing; Nintendo's launch of the DSi was intended to stimulate sales. The company was less concerned with releasing the DSi in other territories, where DS Lite market demand remained high. Development of a large DS Lite model in 2007 eventually led to the DSi XL (known in Japan as the Nintendo DSi LL (ニンテンドーDSi LL)). Nintendo had designed a large DS Lite model with 3.8-inch (97 mm) screens, compared to the standard 3-inch (76 mm) screens; development of this new handheld advanced far enough that it could have begun mass production. However, Iwata placed the project on hold due to consumer demand for the DS Lite and Wii. He later pitched the idea of simultaneously releasing large and small versions of the DSi instead, but Nintendo's hardware team was incapable of developing two models concurrently. After finishing work on the DSi, Kuwahara started the DSi XL project and became project leader. The DSi XL, a DSi model with 4.2-inch (110 mm) screens, was announced on October 29, 2009. Various names for it were considered, including "DSi Comfort", "DSi Executive", "DSi Premium", "DSi Living", and "DSi Deka" (Japanese for "large"). Mario creator Shigeru Miyamoto insisted on "DSi Deka". The handheld has an improved viewing angle over its predecessor, which allows onlookers to see the screen's contents more easily. This feature was absent from the large DS Lite model due to cost issues at the time, which also limited LCD screen size. The cost of LCD screens is determined by how many pieces are cut from a single large glass sheet. To keep these costs within a certain threshold, Nintendo set a screen size limit of approximately 3.8 inches (97 mm), which was later increased to 4.2 inches (110 mm). On November 1, 2008, the DSi was released in Japan; on April 2, 2009, in Australia and New Zealand, and on April 3 in Europe, all with a black and white casing. It launched in the United States and Canada on April 5, alongside the game Rhythm Heaven. It was the first DS console to launch with multiple colors in North America—black and blue. iQue released a Chinese DSi model in black and white, with a pre-installed version of Nintendogs, in December 2009; the Nikkei Sangyo Shimbun reported that the Chinese and Korean models featured improved security, to combat piracy. 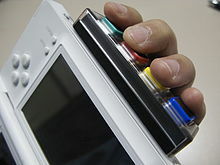 On April 15, 2010, the DSi was launched in South Korea in white, black, blue, and pink, alongside the game MapleStory DS. MapleStory DS was also bundled with a red limited-edition DSi, which had characters from the game printed around its external camera. Other countries the DSi was released in include Brazil, Russia, and Turkey. Nintendo had shipped 200,000 units for the DSi's Japanese launch, and during its first two days on sale, over 170,000 units were sold[cn 2]—the remaining units were either unclaimed pre-orders or reserved for sale on Culture Day. By the end of the month, the DSi sold 535,000 units, in comparison to 550,000 DS Lites sold in its launch month. In the two-day launch period, Europe and North American sales totaled 600,000 units combined. North American first week sales almost doubled the DS Lite's 226,000 units by selling 435,000. In the UK, the console totaled 92,000 sales within two days of release, which GfK/Chart-Track data showed to be the fourth-best opening weekend ever in the region—higher than previous records set by other DS iterations. DSi launch events were held on the western and eastern coasts of the United States. Nintendo sponsored an official launch event at the Universal CityWalk in Los Angeles and the Nintendo World Store in New York City. The LA midnight launch party featured several events, including merchandise handouts, signings and art galleries from iam8bit, parkour demonstrations, and performances by Gym Class Heroes. Hundreds attended and over 150 stayed until midnight to purchase a unit at GameStop. A human-sized Lego DSi by artist Sean Kenney was on display at the Nintendo World Store. The Nintendo DSi XL was released in Japan on November 21, 2009, in bronze, burgundy, and white. The former two colors were available for its European launch on March 5, 2010, and its North American launch on March 28. The console launched in Australia on April 15, 2010, in bronze and burgundy. The DSi XL was released in other countries including Brazil, South Africa, and Turkey. Over 100,500 units were sold during the console's first two days on sale in Japan,[cn 3] and 141,000 units were sold during its first three days in the United States. The 2011 release of the Nintendo 3DS, the successor to the Nintendo DS series of handhelds, was announced on March 23, 2010, to preempt impending news leaks by the Japanese press and to attract potential attendees to the Electronic Entertainment Expo. According to industry analysts, the timing drew attention from the North American launch of the DSi XL. M2 Research senior analyst Billy Pigeon argued the "XL is old news ... in Japan – and Nintendo is a very Japan-centric organization. This is just the corporate parent in Japan maybe not acting in the best interest of Nintendo of America." Iwata dismissed any significant impact when speaking to concerned investors, "those who are eager to buy Nintendo 3DS right after the announcement generally tend to react quickly to anything new on the market, and those who are purchasing a Nintendo DS today tend to react relatively slowly." DSi and DSi XL combined (orange). Nintendo targeted a wider demographic profile with the first Nintendo DS (2004) than it had with the Game Boy line. Comparing 2008 life-to-date DS and DS Lite sales to the best-selling game console, Sony's PlayStation 2, showed potential in further expanding the Nintendo DS gaming population—particularly in Europe and the United States. To further promote the product line while expanding its gaming population, Nintendo created the DSi. Iwata has said that families often share DS and DS Lite consoles, so to encourage each family member to buy an individual handheld, Nintendo added personalization features to the DSi. While cell phone and digital camera manufacturers have been trying to compete against each other by intensifying the picture pixel quality and zooming ability of their camera functions, and while music players are making its improvements mainly by making smaller exterior design and by increasing memory storage capacity, DSi is trying to propose a different path of evolution by providing the users with the opportunity to be able to touch and play with photographs and sounds. The DSi helped maintain strong sales for Nintendo's handheld product line. The DSi accounted for 40 percent of its product line's 2009 UK sales and frequently topped weekly sales charts in Japan during its first year of availability. In the United States, the console's initial three-month sales surpassed those of the DS, DS Lite, and Wii. Average weekly sales of the Wii and Nintendo DS declined slightly in March; Nintendo DS hardware sales stabilized at over 200,000 units for seven months after the DSi's April launch, while Wii sales diminished. Gamasutra estimated that, in October 2009 and February 2010, 50 percent of Nintendo DS unit sales were DSi consoles. In an October 2009 interview, Fils-Aimé announced that the DSi had sold 2.2 million units in the United States. He said, "If you give the consumer great value in terms of what they pay, they're willing to spend, and we say [that] based on the experience of launching the DSi". The United States had its highest yearly DS sales in 2009 with 11.22 million units sold. The DSi and DSi XL accounted for 16.88 million of the 27.11 million units sold worldwide of its product line for Nintendo's 2009 fiscal year beginning April 1, 2009 and ending March 31, 2010. In Gamasutra's United States hardware sales estimate for July 2010, the DSi and DSi XL each outsold the DS Lite. The website reported DSi sales of approximately 300,000 units in July 2009 and February 2010, which remains consistent for July 2010 if combined with DSi XL sales. As a result, the average price consumers were spending on the Nintendo DS hardware family rose to over $165 (in 2004 dollars, $190 adjusted for inflation as of 2010), which is over $15 more than the November 2004 launch price of the original Nintendo DS. Nintendo made its first DSi price cuts in Europe on June 18, 2010, for DSi and DSi XL consoles in Japan on June 19, and in North America on September 12. The DSi and DSi XL accounted for 14.66 million of the 17.52 million units sold worldwide of its product line in fiscal year 2010. In a United States hardware sales estimate for July 2011 by Gamasutra following the DS Lite's price drop a month earlier, about 60 to 70 percent of approximately 290,000 DS units sold were DSi and DSi XL consoles. Lackluster 3DS sales forced Nintendo to drop its price to match the DSi XL in the United States on August 12. Japan and Europe had similar price reductions. Gamasutra speculated potential DS buyers in the United States opted for the 3DS as a result; DS sales for August 2011 decreased by 45 percent, while it combined with 3DS sales remained steady compared to the previous month. Nintendo made its second DSi and DSi XL price cuts in North America on May 20, 2012. Gamasutra called these price cuts the DS product line's "final send-off" and expects "by this time next year its contributions to the market will be minuscule. After Christmas, Nintendo will effectively be a single-handheld system company, putting all of portable software efforts into the Nintendo 3DS." The Nintendo DSi's design is similar to that of the second DS iteration, the Nintendo DS Lite. It is approximately 12 percent shorter (0.10 inches (2.5 mm)) than the Nintendo DS Lite when closed, but slightly wider and lighter. The DSi has two 3.25-inch (83 mm) TFT-LCD screens—.25 inches (6.4 mm) larger than those of previous models—that are capable of displaying 262,144 colors. The touch sensitive lower screen accepts input from the included stylus. The handheld features four lettered buttons (X, Y, A, B), a directional pad, and Start, Select, and Power buttons. Two shoulder buttons, a game card slot, and a power cable input are placed under the console's hinge. The included AC adapter (WAP-002) is not compatible with any previous DS model. Unlike previous models, the handheld has two VGA (0.3-megapixel) digital cameras. The first is on the internal hinge and points toward the user; the second is on the outer casing and faces away from the user. The SD card slot is also new, set behind a cover on the right side. While the DS Lite used a switch, the DSi, like the original Nintendo DS, features a button to power on or off. The button has extra functions and unlike the original's power button, it is located on the bottom-left side of the touchscreen. Brightness and volume controls are on the left side; five brightness settings—one more than on the DS Lite—are available. The headset port is on the bottom. The DSi has a matte surface to hide fingerprints. It is available in numerous colors, but color selection varies by region. For example, lime green is exclusive to Japan, while red is available in Europe and North America. North America also received a different shade of blue. Numerous special-edition models and bundles have been released, including those for Ace Attorney Investigations: Miles Edgeworth, Final Fantasy Crystal Chronicles: Echoes of Time, and the 2009 Black Friday shopping day. The DSi has more RAM and a faster CPU than the DS Lite. Developers reported the console has a native mode, which runs software specifically designed for its hardware, access to the system's extra processing and memory resources. The inclusion of a codec integrated circuit (a microchip) amplifies sound signals and converts them from digital to analog. This increases audio output, and depending on the mode, higher audio quality. Unused space on the motherboard was removed; the CPU was relocated, and the battery housing was expanded. The camera's resolution is two-and-a-half times higher than the handheld's screens. However, their resolution is considerably lower than contemporaneous digital cameras and mobile phones. This was done to help keep their price reasonable and to maintain a preferable response time for viewing photos in quick session, particularity since numerous applications will use them. CPU: The DSi has two ARM architecture CPUs: ARM9 clocked at 133 MHz and ARM7 clocked at 33 MHz. Its ARM9 is twice as fast as previous models. Battery: Shorter than the DS Lite, regardless of brightness setting; for example, the DSi has a battery life of 9–14 hours on the lowest brightness setting, compared to the 15–19 hours of the DS Lite on the same setting. The battery is an 840 mAh internal rechargeable, compared to 1000 mAh for the DS Lite, and has an optimal lifespan of approximately 500 cycles; after this point, it may be replaced by the user. The Nintendo DSi (left) with its DSi XL model. The larger model's white, black (pictured), and burgundy color schemes were intended to match with living room and dining room settings. The Nintendo DSi XL features larger screens, and a greater overall size, than the original DSi. It is the fourth DS model, the first to be available as a pure size variation. Iwata said that cost restraints had, until then, limited the screen size and multiplayer aspects of portable game consoles, and that the DSi XL offers "an improved view angle on the screens", which makes it the first "portable system that can be enjoyed with people surrounding the gamer." He argued that this introduces a new method of playing portable video games, wherein those "surrounding the game player can also join in one way or the other to the gameplay." While the original DSi was specifically designed for individual use, Iwata suggested that DSi XL buyers give the console a "steady place on a table in the living room," so that it might be shared by multiple household members. The DSi XL is the longest, widest and heaviest DS model. The console features two 4.2-inch (110 mm) wide-viewing-angle LCD screens with the same resolution as the smaller model. It has improved battery life over the DSi on all brightness settings; for example, batteries last 13–17 hours at the dimmest setting. The handheld is outfitted with identical speakers contained in larger speaker enclosures, enabling them to produce louder sound. The hinges stop the screen at 120° in addition to the original DSi's position of 155° to allow easier table-top viewing. The DSi XL is bundled with two longer styli, one of which is thicker, rounded, and pen-like, and does not fit inside the unit. The DSi XL has a matte surface, and the exterior of its top panel is coated with a gloss finish. It is available in eight two-toned colors, varying by region such as white, green, red, yellow, and pink. Two special-edition models were released: those for LovePlus+ and the 25th anniversary of Super Mario Bros. Flipnote Studio and the Nintendo DSi Browser come pre-installed with the DSi XL, alongside other, region-specific software. Like the Wii, the DSi has upgradeable firmware, and features a menu interface that displays applications as selectable icons. The seven primary icons represent "Card Software", "Nintendo DSi Camera", "Nintendo DSi Sound", "Nintendo DSi Shop", "DS Download Play", "PictoChat", and "system settings"; additional applications may be downloaded from the DSi Shop. Icons are set in a grid navigable with the stylus or D-pad, and may be re-arranged via drag-and-drop. The power button can either soft reset the console, returning it to the main menu, or shut it down. Game cards may be hot swapped when the console is set to the main menu, allowing players to switch game cards without shutting down. The DSi has more extensive multimedia features than previous models; AAC audio files from other devices, pictures, and downloadable software can be stored to an SD card. The latter two do not need external storage and can be stored internally. Before taking a photograph, users may modify the viewfinder's live image with ten "lens" options. Images captured can be uploaded to the Wii's Photo Channel, and, for consoles with the 1.4 firmware update or greater, to the social networking website Facebook. The built-in sound player has voice recording and music playback functionality. Voice recordings can be edited with audio filters and manipulated through pitch and playback. Users may save and modify up to 18 ten-second sound clips. These clips cannot be exported to an SD card. Users can play music from SD cards with visualizations displayed on the upper screen. AAC audio with .mp4, .m4a, or .3gp filename extensions are supported, but non-AAC formats, including MP3, are not supported. Sounds like drum beats and the classic Mario jumping noises can be added with button presses. Playing music also has its own set of manipulation options similar to those used for voice recordings, as well as a group of audio filters. Using headphones, music can be played when the case is closed. Users may export photos, sounds, and Internet settings to a 3DS. The Nintendo DSi connects to the Internet via either its built-in 802.11b/g Wi-Fi or a Nintendo Wi-Fi USB Connector; both methods grant access to the Nintendo Wi-Fi Connection service. The DSi supports WEP, WPA (AES/TKIP), and WPA2 (AES/TKIP) wireless encryption; only software with built-in support can use the latter two encryption types, as they were not supported by the DS and DS Lite. Up to six wireless Internet connection profiles can be saved; using the traditional setup method, the first three profiles support WEP encryption, while the remaining three are selectable under a more advanced option, which supports WPA encryption. Under this advanced option, users may access the Wi-Fi Protected Setup method and configure proxy settings. The DSi can automatically detect Nintendo Zone service areas thus preventing the need to manually setup Wi-Fi connections. The service offers demos of upcoming and currently available games, access to the Nintendo Wi-Fi Connection and DSi Shop, and may have location-specific content. All DS games are compatible with the DSi, except those that require the GBA slot. Because of its absence, the DSi is not backward compatible with GBA Game Paks or with accessories that require the GBA slot, such as the Nintendo DS Rumble Pak and the Guitar Hero: On Tour series guitar grip. "DSi-enhanced" game cards contain DSi-exclusive features, but can still be used with earlier models; "DSi-exclusive" game cards cannot. The DSi is Nintendo's first region-locked handheld; it prevents using certain software released for another region. Due to regional differences in Internet services and parental controls, DSi-specific software is region locked. However, cartridge software compatible with previous models, Internet browsing, and photo sharing are not locked. [cn 4] Homebrew flash cards designed for previous DS models are incompatible with the DSi, but new cards capable of running DS software on a DSi were available. Like the Wii, the DSi can connect to an online store. The store, called the DSi Shop, allows users to download DSiWare games and applications, which are paid for with a Nintendo Points Prepaid Card (previously known as Wii Points Prepaid Card). Application prices follow a three-tiered pricing scheme. The service launched with the DSi Browser, a free web browser developed by Opera Software and Nintendo. A DSiWare trial campaign, whose expiration date varied by region, formerly offered 1,000 free Nintendo Points to each DSi that accesses the DSi Shop. [cn 5] As of June 2011, over 350 downloadable games were available, varying by region. Purchased DSiWare on DSi or DSi XL consoles cannot be transferred between units unless that console is repaired or replaced by Nintendo. Most DSiWare can be transferred to a 3DS, however saved data cannot. Nintendo Points became irredeemable on September 30, 2016, and the Nintendo DSi Shop was shut down on March 31, 2017. The Nintendo DSi received generally positive reviews. Critics praised many of the console's changes to the DS Lite's aesthetic and functionality, but complained that it launched with insufficient exclusive software. [cn 6] IGN's Craig Harris noted that the DSi-exclusive software library and DSi Shop were lacking in content even after five months on the Japanese market. Jeff Bakalar of CNET said that owners of the original DS should consider buying a DSi, but that its only incentive for DS Lite owners was the DSi Shop. PCWorld New Zealand's Jan Birkeland shared Bakalar's opinion, but believed that it was too early to judge the quality of DSi Shop software. Many critics were disappointed by the removal of the GBA cartridge slot,[cn 7] but some of them, such as PCWorld's Darren Gladstone, Bit-tech's Joe Martin, and IGN's Harris and Lowe, believed that it was a reasonable exchange for SD card support and the DSi Shop. However, Bakalar stated, "We'd gladly give up the 4 millimeters [of reduced thickness] to be able to play any Game Boy Advance game." Most reviewers criticized the quality of its cameras, particularly due to their resolution in comparison to contemporaneous mobile phones. They considered them sufficient for the DSi's screens, however. Harris and Lowe believed that the camera's only use was to take "silly pictures of yourself and others". They complained about the difficulty of taking photographs in low-light environments, and said that low-light images were tinged green or blue. Opinions on the DSi's photograph-editing tools were varied: Bit-tech's Martin and Reid considered them to be a gimmick, but Bakalar and Cliff Edwards of BusinessWeek thought otherwise. Edwards said that the camera's use in gameplay was a new opportunity for developers; Martin did not think that the concept would be widely adopted, as he believed it to be "a gimmick that would alienate [...] DS Lite owners". Eurogamer's Tom Bramwell speculated that the DSi follows Game & Watch and Game Boy creator Gunpei Yokoi's philosophy of using dated technology developers are familiar with to introduce new game design concepts that are inexpensive enough for mass production at a profit. He argued its features are designed to "briefly entertain" early adopters while encouraging "developers to consider it as an alternative [of the DS Lite]" to build an attractive game library for the long term. Douglas Rankine of Wired UK and McKinley Noble of GamePro thought previously existing Nintendo DS games were revitalized with the Nintendo DSi XL's larger screens; games like Scribblenauts and The World Ends with You benefited from increased touchscreen precision and increased legibility of text, respectively. CVG's Mike Jackson argued that the bigger screens, which made its unchanged resolution blockier, would probably be less noticeable to the older demographic for which the XL is undoubtedly designed. However, Jackson and IGN's Scott Lowe and Chris Burke agreed its clear and vivid colors considerably compensated for its unchanged resolution. Carol Mangis of PC Magazine thought families looking to share a handheld between members should consider a DSi XL, but the larger screens were not enough of an incentive for current DSi owners to upgrade. Lowe, Burke, Jackson, and Bakalar concluded the larger DSi model is not an essential upgrade; Jackson explained "if you tend not to carry it out with you, and only ever tend to use it at home, then the DSi XL is the better choice". Game Boy Micro—second revision of Nintendo's previous handheld product line. ^ 170,779 units were sold according to sales tracking service Enterbrain; or 171,925 units according to Media Create. ^ 103,524 units were sold according to sales tracking service Enterbrain; or 100,553 units according to Media Create. ^ IGN, however, tested a United States DSi-enhanced game on a Japanese DSi handheld and found it to be region-locked. ^ Trial expiration date is based on when the DSi is released for the respective region. For example, expiring March 2010 in Japan, but March 2011 in China. ^ According to Bit-tech, PCWorld New Zealand, Ars Technica, IGN, and CNET UK. ^ According to Bit-tech, CNET, BusinessWeek, IGN, and PCWorld. ^ According to Bit-tech, Ars Technica, BusinessWeek, IGN, Eurogamer, and GameSpot. ^ a b c d e f "ニンテンドーDSi LL：スペック" (in Japanese). Nintendo. Archived from the original on 2011-07-22. Retrieved 2009-11-09. ^ "GDC 2009 Reveals New Suda, Ueda, Nintendo DSi Talks". Game Developers Conference. United Business Media. 2009-02-25. Archived from the original on 2009-04-01. Retrieved 2011-06-17. ^ a b c d e Masato Kuwahara; Yui Ehara; Kentaro Mita. "Nintendo DSi (Volume 1 – Hardware)". Iwata Asks (Interview: Transcript). Interviewed by Satoru Iwata. Kyoto, Japan: Nintendo. p. 1. Archived from the original on 2011-07-14. Retrieved 2010-04-17. ^ a b Masato Kuwahara; Masaki Amano; Kazou Yoneyama; Takaki Fujino (2009-11-30). "Nintendo DSi XL". Iwata Asks (Interview: Transcript). Interviewed by Satoru Iwata. Kyoto, Japan: Nintendo. p. 2. Archived from the original on 2010-11-26. Retrieved 2010-02-11. ^ Satoru Iwata. "Nintendo DSi (Volume 4 – Asking Iwata)". Iwata Asks (Interview: Transcript). Interviewed by Yasuhiro Nagata. Kyoto, Japan: Nintendo. Archived from the original on 2010-11-26. Retrieved 2011-06-03. ^ a b Satoru Iwata 2008, p. 2. ^ a b c d Masato Kuwahara; Yui Ehara; Kentaro Mita. "Nintendo DSi (Volume 1 – Hardware)". Iwata Asks (Interview: Transcript). Interviewed by Satoru Iwata. Kyoto, Japan: Nintendo. p. 2. Archived from the original on 2011-08-09. Retrieved 2010-04-17. ^ Anoop Gantayat (2008-10-27). "Satoru Iwata asks about DSi". Andriasang. Archived from the original on 2008-11-02. Retrieved 2009-12-15. ^ a b c d Masato Kuwahara; Yui Ehara; Kentaro Mita. "Nintendo DSi (Volume 1 – Hardware)". Iwata Asks (Interview: Transcript). Interviewed by Satoru Iwata. Kyoto, Japan: Nintendo. p. 3. Archived from the original on 2011-08-09. Retrieved 2010-04-17. ^ a b Satoru Iwata 2008, p. 1. ^ "PSP (PlayStationPortable) Worldwide Hardware Unit Sales". Sony Computer Entertainment. Archived from the original on July 22, 2011. Retrieved September 18, 2011. ^ a b c "Consolidated Sales Transition by Region" (PDF). Nintendo. p. 1. Archived from the original (PDF) on July 28, 2011. Retrieved 2011-08-31. ^ Marc Nix (2007-03-23). "The Future of PlayStation Portable". IGN. Fox Interactive Media. Archived from the original on 2009-02-21. Retrieved 2011-11-02. ^ Patrick Klepek (2008-10-02). "New Nintendo DSi Won't Be Sold In U.S. Until 'Well Into 2009'". MTV Networks. Viacom. Archived from the original on May 29, 2010. Retrieved 2008-10-03. ^ Satoru Iwata (2008-04-25). "Financial Results Briefing". Nintendo. p. 2. Archived from the original on 2008-04-30. Retrieved 2009-06-20. ^ a b c Masato Kuwahara; Masaki Amano; Kazou Yoneyama; Takaki Fujino (2009-11-30). "Nintendo DSi XL". Iwata Asks (Interview: Transcript). Interviewed by Satoru Iwata. Kyoto, Japan: Nintendo. p. 1. Archived from the original on 2010-11-25. Retrieved 2010-02-11. ^ a b c d e f Tor Thorsen (2009-10-29). "DSi XL hits US & EU Q1 2010, DS sales top 113 million". GameSpot. CBS Interactive. Archived from the original on 2010-07-24. Retrieved 2009-10-29. ^ Anoop Gantayat (2009-12-15). "The Other DSi LL Names". Andriasang. Archived from the original on 2010-06-08. Retrieved 2009-12-15. ^ a b Jeff Bakalar; Charles Kloet (April 16, 2010). "Nintendo DSi XL review". CNET UK. CBS Interactive. pp. 1, 3. Archived from the original on September 30, 2010. Retrieved November 13, 2011. ^ a b Satoru Iwata 2008, p. 5. ^ James Kozanecki (2009-02-18). "Nintendo DSi set for April 2 Aussie Launch". GameSpot. CBS Interactive. Archived from the original on 2013-02-04. Retrieved 2009-06-20. ^ Michael French (2009-02-19). "Nintendo DSi hits Europe on April 3rd, priced £149.99". Market for Home Computing and Video Games. Intent Media. Archived from the original on 2009-03-18. Retrieved 2009-02-25. ^ a b "Nintendo DSi launches April 5 in the United States". Nintendo of America. Nintendo. 2009-02-18. Archived from the original on May 29, 2010. Retrieved 2009-02-18. ^ a b c d e Craig Harris (2009-07-06). "Nintendo DSi Interim Report". IGN. Fox Interactive Media. pp. 1–2. Archived from the original on 2011-08-07. Retrieved 2009-07-30. ^ Anoop Gantayat (2009-12-08). "Chinese DSi Comes With Nintendogs Built In". Andriasang. Archived from the original on 2010-06-05. Retrieved 2009-12-23. ^ "iQue DSi 新颜色4月发售" (in Chinese). iQue. 2010-03-18. Archived from the original on September 20, 2010. Retrieved 2010-09-19. ^ Anoop Gantayat (2009-10-27). "Nintendo Plans DS Push". Andriasang. Archived from the original on 2011-06-22. Retrieved 2009-12-23. ^ "한 국닌텐도, 닌텐도 DSi 및 신작 소프트웨어 발표" (Press release) (in Korean). Nintendo Korea. 2010-02-25. Archived from the original on May 29, 2010. Retrieved 2010-04-10. ^ "DSi oficialmente no Brasil". Tambor Digital (in Portuguese). Nintendo. Archived from the original on July 26, 2011. Retrieved November 2, 2010. ^ "Nintendo DSi". Nintendo of Europe (in Russian). Nintendo. Archived from the original on October 31, 2010. Retrieved 2010-10-31. ^ a b "Konsollar". Nortec Eurasia (in Turkish). Nintendo of Europe. Archived from the original on October 31, 2010. Retrieved October 31, 2010. ^ a b Chris Iaquinta (2008-11-05). "Japanese Nintendo DSi Sales". IGN. Fox Interactive Media. Archived from the original on 2009-02-03. Retrieved 2008-11-07. ^ Rob Crossley (2008-11-07). "PS3 Outsells All Home Consoles in Japan". Edge. Future plc. Archived from the original on 2009-02-05. Retrieved 2011-01-30. ^ John Tanaka (November 3, 2008). "Viewtiful Joe Coming to Tatsunoko VS Capcom". IGN. Fox Interactive Media. Archived from the original on January 3, 2009. Retrieved September 22, 2011. ^ Ben Parfitt (2008-12-02). "Japan: DSi sells half a million". Market for Home Computing and Video Games. Intent Media. Archived from the original on 2009-02-05. Retrieved 2008-12-07. ^ Oli Welsh (2009-04-09). "Nintendo ready to revive the Japanese market – Iwata". GamesIndustry.biz. Eurogamer Network. Archived from the original on 2009-05-06. Retrieved 2009-04-09. ^ Tom Ivan (2009-04-17). "DSi: 435,000 First Week US Sales". Edge. Future plc. Archived from the original on 2009-04-20. Retrieved 2010-07-26. ^ Tim Ingham (2009-04-07). "DSi sells 92,000 in two days". Market for Home Computing and Video Games. Intent Media. Archived from the original on 2009-04-10. Retrieved 2009-04-09. ^ Christopher Dring (2009-04-06). "DSi enjoys rampant demand in debut weekend". Market for Home Computing and Video Games. Intent Media. Archived from the original on 2009-04-09. Retrieved 2009-03-24. ^ a b McKinley Noble; Will Herring (2009-04-07). "Nintendo DSi: Launch Party @ Universal Studios". GamePro. IDG. pp. 1–3. Archived from the original on 2009-06-11. Retrieved 2009-04-11. ^ Craig Harris (2009-03-31). "DSi Launch Party in LA This Saturday". IGN. Fox Interactive Media. Archived from the original on 2009-04-03. Retrieved 2010-03-15. ^ John Chan (2009-04-08). "Human-sized Lego DSi model". CNET. CBS Interactive. Archived from the original on 2014-04-27. Retrieved 2014-04-26. ^ a b Kath Brice (2010-01-14). "Nintendo DSi XL to launch in Europe in March". GamesIndustry.biz. Eurogamer Network. Archived from the original on 2010-01-17. Retrieved 2011-09-10. ^ a b Michael Thompson (2010-02-25). "Nintendo shows off new DSi, digital games push at summit". Ars Technica. Condé Nast Publications. Archived from the original on 2010-05-31. Retrieved 2010-03-01. ^ Adam Ghiggino (2010-04-14). "Nintendo DSi price drop". PAL Gaming Network. Archived from the original on July 29, 2010. Retrieved 2010-08-14. ^ "DSi XL oficialmente no Brasil por R$799". Tambor Digital (in Portuguese). Nintendo. Archived from the original on 2011-07-26. Retrieved 2010-11-02. ^ "A bright future ahead for Nintendo DSi XL". Nintendo of Europe. Nintendo. 2010-10-01. Archived from the original on October 16, 2010. Retrieved 2010-10-16. ^ "ニンテンドーDSi LL、発売から2日間で10万3524台を販売(エンターブレイン調べ)". Famitsu (in Japanese). Enterbrain. 2009-11-24. Archived from the original on 2012-11-22. Retrieved 2013-04-01. ^ Brendan Sinclair (2009-12-04). "Big in Japan Nov. 16-22: DSi XL". GameSpot. CBS Interactive. Archived from the original on 2010-03-17. ^ Kyle Orland (2011-04-14). "Nintendo 3DS Sells Just Under 400,000 In First Week Of U.S. Sales". Gamasutra. United Business Media. Archived from the original on 2012-11-11. Retrieved 2013-04-01. ^ a b "Did Nintendo Doom New Handheld Before Its Release?". CNBC. NBC Universal. 2010-03-29. Archived from the original on 2011-06-11. Retrieved 2010-10-10. ^ Satoru Iwata (2010-05-07). "Financial Results Briefing for Fiscal Year Ended March 2010: Q&A". Nintendo. p. 3. Archived from the original on 2010-05-16. Retrieved 2012-06-18. ^ Patrick Klepek (2010-05-12). "Nintendo Doesn't Believe 3DS Announcement Impacted DSi XL Sales". G4 (U.S. TV channel). Retrieved 2012-06-22. ^ a b "Consolidated Sales Transition by Region" (PDF). Nintendo. 2014-05-07. Archived from the original (PDF) on 2014-10-29. Retrieved 2014-10-29. ^ Travis Fahs (2009-07-27). "IGN Presents the History of Game Boy". IGN. Fox Interactive Media. p. 6. Archived from the original on 2010-05-28. Retrieved 2011-10-22. ^ "Sony Computer Entertainment Asia Starts Its PlayStation Business In Republic Of Indonesia" (Press release). Sony Computer Entertainment. January 18, 2010. Archived from the original on July 3, 2011. Retrieved April 20, 2010. ^ a b c d Satoru Iwata (2008-10-31). "Corporate Management Policy Briefing / Semi-annual Financial Results Briefing". Nintendo. pp. 5–6. Archived from the original on 2008-12-10. Retrieved 2009-06-20. ^ Adam Hartley (February 20, 2009). "What does the 'i' in iPod and DSi mean?". Techradar. Future plc. Archived from the original on April 22, 2012. Retrieved September 18, 2013. ^ Chris Kohler (2009-04-03). "Q&A: Nintendo's Fils-Aime Talks DSi, Wii and Everything in Between". Wired. Condé Nast Publications. Archived from the original on 2009-10-28. Retrieved 2011-06-03. ^ Dave Roberts (2010-01-14). "Trade faces 'premium' DSi XL price". Market for Home Computing and Video Games. Intent Media. Archived from the original on 2010-01-17. Retrieved 2010-02-27. ^ Anoop Gantayat (2009-11-23). "DSi LL Launches in Japan". IGN. Fox Interactive Media. Archived from the original on 2009-11-27. Retrieved 2010-02-12. ^ Matt Casamassina (2009-08-10). "Nintendo Minute: 08.10.09". IGN. Fox Interactive Media. Archived from the original on 2010-12-11. Retrieved 2009-12-12. ^ Matt Matthews (2009-11-16). "NPD: Behind the Numbers, October 2009". Gamasutra. United Business Media. pp. 1, 3–4. Archived from the original on 2010-08-07. Retrieved 2010-02-09. ^ Matt Matthews (2010-03-15). "NPD: Behind the Numbers, February 2010". Gamasutra. United Business Media. p. 4. Archived from the original on 2010-08-10. Retrieved 2010-03-15. ^ Tor Thorsen (2009-10-07). "DSi sells 2.2 million in US, no more Wii price cuts in '09". GameSpot. CBS Interactive. Archived from the original on 2010-01-05. Retrieved 2009-12-14. ^ Satoru Iwata (2009-01-29). "Third Quarter Financial Results Briefing". Nintendo. p. 2. Archived from the original on 2010-02-02. Retrieved 2011-08-08. ^ Matt Matthews (2010-08-16). "NPD: Behind the Numbers, July 2010". Gamasutra. United Business Media. pp. 3–4. Archived from the original on 2011-05-09. Retrieved 2010-09-22. ^ Ben Parfitt (2010-08-31). "Price cuts for DSi and DSi XL". Market for Home Computing and Video Games. Intent Media. Archived from the original on 2010-09-06. Retrieved 2011-01-23. ^ Eric Caoili (2010-06-03). "Nintendo Cutting DSi Prices In Japan, Europe". Gamasutra. United Business Media. Archived from the original on 2011-05-09. Retrieved 2011-01-23. ^ Matt Matthews (2011-08-15). "Analysis: How'd The 3DS Do At $250?". Gamasutra. United Business Media. Retrieved 2011-08-20. ^ Robert Purchese (2011-08-12). "MS: Xbox 360 to end 2011 as global no. 1". Eurogamer. Eurogamer Network. Retrieved 2011-09-11. ^ a b Matt Matthews (2011-09-12). "NPD: Behind the Numbers, August 2011". Gamasutra. United Business Media. p. 3. Archived from the original on 2012-03-12. Retrieved 2011-10-06. ^ Mike Rose (2011-07-28). "Nintendo 3DS Reduced to $170, 20 Free Games For 'Ambassadors'". Gamasutra. United Business Media. p. 3. Retrieved 2011-10-06. ^ Ben Parfitt (2012-05-10). "Nintendo cuts DSi and DSI XL price in US". Market for Home Computing and Video Games. Intent Media. Retrieved 2012-06-24. ^ Matt Matthews (2012-05-14). "Annual U.S. game retail could hit six-year low in 2012". Gamasutra. United Business Media. Retrieved 2012-05-16. ^ a b c d Joe Martin (2009-03-17). "Nintendo DSi Review". Bit-tech. Dennis Publishing. p. 1. Archived from the original on 2009-03-20. Retrieved 2009-03-20. ^ a b c d e Craig Harris (2008-10-07). "DSi: Just the Facts (And a Little Speculation)". IGN. Fox Interactive Media. pp. 1–3. Archived from the original on 2009-03-17. Retrieved 2009-11-19. ^ a b c Joe Martin (2009-03-17). "Nintendo DSi Review". Bit-tech. Dennis Publishing. p. 3. Archived from the original on 2009-03-20. Retrieved 2009-03-20. ^ "Nintendo DSi specifications". CNET. CBS Interactive. Archived from the original on May 29, 2010. Retrieved 2010-03-17. ^ Nintendo 2009, pp. 8, 11. ^ a b Nintendo 2009, p. 13. ^ a b c d e f g Joe Martin (2009-03-17). "Nintendo DSi Review". Bit-tech. Dennis Publishing. p. 2. Archived from the original on 2009-03-20. Retrieved 2009-03-20. ^ a b c d e f g Sarju Shah (2009-04-03). "Nintendo DSi Hands-On". GameSpot. CBS Interactive. p. 2. Archived from the original on May 29, 2010. Retrieved 2009-09-25. ^ a b John Falcone (2009-03-16). "Nintendo DS Lite review". CNET. CBS Interactive. Archived from the original on 2012-09-03. Retrieved 2013-09-17. ^ a b c d e f g Jeff Bakalar (2009-04-05). "Nintendo DSi review". CNET. CBS Interactive. Archived from the original on 2009-06-18. Retrieved 2009-04-20. ^ "Nintendo Unveils Wii Fit Plus Launch Date and New Colors of Nintendo DSi, Wii Remote" (Press release). Nintendo. 2009-09-01. Retrieved 2009-09-01. ^ Rob Crossley (February 25, 2009). "Nintendo Reveals 3 New DSi Colours". Edge. Future plc. Archived from the original on October 27, 2010. Retrieved August 25, 2010. ^ a b "New colours for the Nintendo DSi". Nintendo of Europe. Nintendo. 2009-09-22. Archived from the original on May 29, 2010. Retrieved 2009-09-23. ^ David Jenkins (2009-06-04). "Nintendo unveils black-coloured Wii in Japan". GamesIndustry.biz. Eurogamer Network. Archived from the original on 2009-06-07. Retrieved 2009-06-04. ^ a b Angela Moscaritolo (2012-08-01). "Nintendo Tips Matte Red, Blue DSi Models". PC Magazine. Ziff Davis. Retrieved 2012-08-01. ^ John Tanaka (2008-12-22). "Echoes of Time DSi Design Revealed". IGN. Fox Interactive Media. Archived from the original on 2009-02-06. Retrieved 2009-09-22. ^ Justin Haywald (April 2, 2009). "Limited Edition Ace Attorney DSi Coming to Japan". 1UP.com. UGO Networks. Archived from the original on June 30, 2012. Retrieved June 11, 2009. ^ Peter Ha (2009-11-23). "Two New Nintendo DSi Bundles For Black Friday". Time. Time Inc. Retrieved 2012-02-11. ^ a b Jeff Bakalar (2009-02-20). "Gaming preview: Who should buy the Nintendo DSi and who shouldn't". CNET. CBS Interactive. Archived from the original on 2011-06-17. Retrieved 2009-03-18. ^ Craig Harris (2009-02-04). "Virtual Console on DSi?". IGN. Fox Interactive Media. Archived from the original on 2009-02-26. Retrieved 2010-10-01. ^ Ray Barnholt (March 26, 2009). "GDC 2009: What Inspired the DSi's Creation?". 1UP.com. UGO Networks. Archived from the original on October 19, 2012. Retrieved May 28, 2011. ^ Scott Lowe (2010-09-22). "The Nintendo 3DS vs. The World". IGN. Fox Interactive Media. Archived from the original on 2012-01-20. Retrieved 2013-03-09. ^ a b c d e Jan Birkeland (2009-05-26). "Nintendo DSi: Handheld console". PCWorld. Fairfax Media Business Group. Archived from the original on May 29, 2010. Retrieved 2010-02-06. ^ Craig Harris (2004-09-20). "Nintendo DS Specs". IGN. Fox Interactive Media. Archived from the original on 2010-07-06. Retrieved 2011-05-28. ^ a b c d e Ben Kuchera (2009-04-04). "The toy that roared: Ars reviews the DSi". Ars Technica. Condé Nast Publications. pp. 2–3. Archived from the original on 2009-06-20. Retrieved 2010-02-09. ^ a b Anoop Gantayat (2008-11-01). "DSi Versus The Internet". IGN. Fox Interactive Media. Archived from the original on 2009-01-22. Retrieved 2009-02-22. ^ a b "Nintendo DSi & Nintendo DSi XL – SD Cards". Nintendo of America. Nintendo. Archived from the original on August 20, 2010. Retrieved 2010-05-27. ^ a b Masato Kuwahara; Masaki Amano; Kazou Yoneyama; Takaki Fujino (2009-11-30). "Nintendo DSi XL". Iwata Asks (Interview: Transcript). Interviewed by Satoru Iwata. Kyoto, Japan: Nintendo. p. 4. Archived from the original on 2011-09-07. Retrieved 2010-02-11. ^ a b c d Satoru Iwata (2009-10-30). "Corporate Management Policy Briefing / Semi-annual Financial Results Briefing". Nintendo. pp. 9–10. Archived from the original on 2009-11-06. Retrieved 2009-11-09. ^ Anoop Gantayat (2006-02-10). "DS Lite Colors Revealed". IGN. Fox Interactive Media. Archived from the original on 2009-02-03. Retrieved 2009-12-03. ^ Nintendo 2009, p. 111. ^ Chris Kohler (2010-02-01). "Product reviews: Nintendo DSi XL". Wired. Condé Nast Publications. Archived from the original on 2010-08-12. Retrieved 2010-04-07. ^ a b c Scott Lowe; Chris Burke (2009-04-06). "Nintendo DSi XL Review". IGN. Fox Interactive Media. Archived from the original on 2010-09-15. Retrieved 2009-04-20. ^ Craig Harris (2010-06-08). "Midnight Blue DSi XL in July". IGN. Fox Interactive Media. Archived from the original on 2011-08-03. Retrieved 2010-07-14. ^ a b "New Colours for Nintendo DSi XL (Plus great new Nintendo DS games)". Nintendo Australia. Nintendo. 2010-08-26. Archived from the original on September 5, 2010. Retrieved 2010-09-05. ^ a b c Anoop Gantayat (2010-06-02). "You'll Love the Love Plus+ DSi LL Systems". Andriasang. Archived from the original on 2010-06-07. Retrieved 2010-10-14. ^ a b "A bright future ahead for Nintendo DSi XL". Nintendo of Europe. Nintendo. 2010-09-14. Archived from the original on September 19, 2010. Retrieved 2009-09-23. ^ Chris Pereira (September 9, 2011). "DSi XL, Still the Same Price as a 3DS, Gets Pink as a New Color". 1UP.com. UGO Networks. Archived from the original on October 15, 2011. Retrieved October 6, 2011. ^ Anoop Gantayat (2010-06-02). "Nintendo Readying Mario Anniversary DSi LL". Andriasang. Archived from the original on 2010-10-03. Retrieved 2010-10-12. ^ Masato Kuwahara; Masaki Amano; Kazou Yoneyama; Takaki Fujino (2009-11-30). "Nintendo DSi XL". Iwata Asks (Interview: Transcript). Interviewed by Satoru Iwata. Kyoto, Japan: Nintendo. p. 5. Archived from the original on 2011-09-04. Retrieved 2010-02-11. ^ Chris Leyton (October 29, 2009). "Nintendo Announces DSi LL News". Total Video Games. TVG Media Ltd. Archived from the original on November 1, 2009. Retrieved November 24, 2009. ^ a b c d e f Cliff Edwards (2009-04-10). "Nintendo's New DSi: Well Worth the Money". BusinessWeek. McGraw-Hill. Archived from the original on May 29, 2010. Retrieved 2009-04-20. ^ Nintendo 2009, pp. 24–25. ^ Masato Kuwahara; Yui Ehara; Kentaro Mita. "Nintendo DSi (Volume 1 – Hardware)". Iwata Asks (Interview: Transcript). Interviewed by Satoru Iwata. Kyoto, Japan: Nintendo. p. 4. Archived from the original on 2011-08-09. Retrieved 2010-04-17. ^ Sarju Shah (2009-04-03). "Nintendo DSi Hands-On". GameSpot. CBS Interactive. p. 1. Archived from the original on May 29, 2010. Retrieved 2009-09-25. ^ Mike Jackson (2009-04-24). "7 DSi Features You May Have Missed". ComputerAndVideoGames.com. Future plc. Archived from the original on 2009-04-27. Retrieved 2013-10-20. ^ Nintendo 2009, pp. 29–31. ^ Craig Harris (2008-11-05). "IGN: Nintendo DSi Hands-on". IGN. Fox Interactive Media. p. 2. Archived from the original on 2009-02-23. Retrieved 2009-03-18. ^ a b Satoru Iwata 2008, p. 3. ^ "Facebook integration with the Nintendo DSi Camera". Nintendo of America. Nintendo. Archived from the original on May 29, 2010. Retrieved 2010-01-24. ^ Nintendo 2009, p. 102. ^ a b "What Is Transferred During the Data Transfer Process?". Nintendo of America. Nintendo. Retrieved 2011-08-23. ^ Nintendo 2009, pp. 76–79. ^ Nintendo 2009, p. 94. ^ "Wireless Home Router Support". Nintendo of America. Nintendo. Retrieved 2009-07-03. ^ 青山; 畑山; 藤原 (2008). "社長が訊く「ニンテンドーWi-Fiネットワークアダプタ". Iwata Asks (Interview: Transcript) (in Japanese). Interviewed by Satoru Iwata. Kyoto, Japan: Nintendo. Archived from the original on 2009-05-01. Retrieved 2009-09-24. Though the new browser and those programs designed exclusively for the DSi will use a high level of security, existing DS software will use existing encryption. ^ Nintendo 2009, pp. 87–88. ^ a b Craig Harris (2008-10-17). "DSi: Bye Bye GBA Slot". IGN. Fox Interactive Media. pp. 1–2, 4. Archived from the original on 2009-03-01. Retrieved 2009-02-22. ^ "Frequently Asked Questions (What games can be played on the Nintendo DSi?)". Nintendo of America. Nintendo. Retrieved 2009-10-28. ^ Craig Harris (2009-03-25). "GDC 09: DSi Hybrid, Exclusive Carts Soon". IGN. Fox Interactive Media. Archived from the original on 2009-03-27. Retrieved 2010-06-23. ^ a b Craig Harris (2009-09-22). "Yes, DSi Carts are Region Locked". IGN. Fox Interactive Media. Archived from the original on 2010-12-12. Retrieved 2011-11-04. ^ a b c Tom Bramwell (2008-10-06). "Nintendo DSi software region-locked". Eurogamer. Eurogamer Network. Archived from the original on 2009-01-26. Retrieved 2009-02-25. ^ Christopher Dring (2008-12-04). "Hackers crack the DS". Market for Home Computing and Video Games. Intent Media. Archived from the original on 2009-05-30. Retrieved 2009-02-25. ^ a b Satoru Iwata 2008, p. 4. ^ "iQue DSiWare" (in Chinese). iQue. Archived from the original on 2009-12-06. Retrieved 2009-12-11. ^ "June 6 Nintendo 3DS system update adds Internet Browser, online store and Pokédex 3D" (Press release). Nintendo. 2011-06-02. Retrieved 2011-06-27. ^ Robert Purchese (2009-09-30). "DSiWare buys are non-transferrable". Eurogamer. Eurogamer Network. Archived from the original on 2009-10-03. Retrieved 2010-03-13. ^ "What DSiWare Games Cannot be Transferred to the Nintendo 3DS?". Nintendo of America. Nintendo. Archived from the original on 2013-02-09. Retrieved 2011-08-23. ^ "A Message about the Nintendo DSi Shop". Nintendo of America. Nintendo. Archived from the original on 2016-04-06. Retrieved 2016-05-04. ^ a b c Jon Jordan (2010-07-26). "Relax and tone your face and neck with DSi's Face Training". Pocket Gamer. Steel Media Limited. Archived from the original on October 4, 2013. Retrieved 2013-10-10. ^ Robert Purchese (2010-07-14). "Nintendo reveals Wii, DS Q3 line-up". Eurogamer. Eurogamer Network. Archived from the original on 2013-10-05. Retrieved 2013-10-10. ^ a b c IGN Staff (2009-11-23). "Konami Announces Foto Showdown For Nintendo DSi". IGN. Fox Interactive Media. Retrieved 2013-10-10. ^ "Foto Showdown". Nintendo. Archived from the original on 2013-02-22. Retrieved 2013-10-10. ^ Anoop Gantayat (2009-09-01). "Japan Gets First DSi Exclusive". IGN. Fox Interactive Media. Retrieved 2013-10-10. ^ "DSiのカメラで遊ぶ『モンスターファインダー』が11月19日に発売". Dengeki Online (in Japanese). ASCII Media Works. 2009-09-30. Archived from the original on 2013-08-07. Retrieved 2013-10-10. ^ a b c d Alexander Sliwinski (2010-10-20). "Ghostwire officially delayed, seeking publisher". Joystiq. AOL Tech. Archived from the original on 2013-10-04. Retrieved 2013-10-10. ^ Greg Miller (March 10, 2010). "GDC 10: Ghostwire: Link to the Paranormal Sneak Peek". IGN. Fox Interactive Media. Archived from the original on October 4, 2013. Retrieved October 10, 2013. ^ a b "Hidden Photos". Game. Baker Acquisitions. Archived from the original on 2016-06-03. Retrieved 2016-06-02. ^ a b "Snap Create Play. Photo fun with your Nintendo DSI" (Press release). PQube. 2010-01-12. Archived from the original on 2011-05-13. Retrieved 2016-06-02. ^ "Hidden Photo by Nintendo DS" (in Italian). GameStop. Archived from the original on 2016-06-03. Retrieved 2016-06-02. ^ a b c d e IGN Staff (2009-10-13). "505 Games Strikes a Pose with Picture Perfect Hair Salon for Nintendo DSi". IGN. Fox Interactive Media. Archived from the original on 2013-10-04. Retrieved 2013-10-10. ^ James Orry (October 13, 2009). "Hair Salon is the first DSi-only game". VideoGamer.com. Pro-G Media. Archived from the original on January 7, 2010. Retrieved January 21, 2014. ^ a b "Our Company". Enjoy Gaming Ltd. Archived from the original on 2013-01-27. Retrieved 2013-10-10. ^ a b "Storm City Entertainment Announces Upcoming Release of "System Flaw," a Nintendo DSi Exclusive Title" (Press release). Business Wire. 2009-10-14. Retrieved 2013-10-10. ^ "First Augmented Reality Game 'System Flaw' Launched" (Press release). Market for Home Computing and Video Games. 2009-11-03. Retrieved 2013-10-10. ^ a b c d e f g Craig Harris; Scott Lowe (2009-04-06). "Nintendo DSi Review". IGN. Fox Interactive Media. Archived from the original on 2009-04-09. Retrieved 2009-04-20. ^ a b c d Rory Reid (2009-03-16). "Nintendo DSi review". CNET UK. CBS Interactive. Archived from the original on May 30, 2010. Retrieved 2009-09-12. ^ a b c d Darren Gladstone (2009-04-01). "Nintendo DSi Review: Slimmer, More Multimedia-Savvy". PCWorld. IDG. Archived from the original on 2011-06-06. Retrieved 2009-04-20. ^ Victor Godinez (2009-04-10). "Loaded but limited – Nintendo DSi features Web access, 2 cameras – and a few problems". The Dallas Morning News. A. H. Belo. p. 2D. ^ a b Lou Kesten (2009-04-08). "Game Review: DSi adds cameras, downloads to – Nintendo's portable". The Daily News. Johnson Newspaper Corporation. Associated Press. p. 1A. ^ Sarju Shah (2009-04-03). "Nintendo DSi Hands-On". GameSpot. CBS Interactive. p. 3. Archived from the original on May 29, 2010. Retrieved 2009-09-25. ^ a b Tom Bramwell (2009-03-06). "Nintendo DSi: A defence". Eurogamer. Eurogamer Network. Archived from the original on 2010-08-19. Retrieved 2010-03-06. ^ a b Pete Metzger (2009-04-05). "Review: Nintendo DSi offers evolutionary, not revolutionary, upgrade over DS Lite". Los Angeles Times. Tribune Company. Archived from the original on May 29, 2010. Retrieved 2009-07-13. ^ Associated Press (2008-10-02). "Analyst: Best Buy video-game sales vulnerable". BusinessWeek. McGraw-Hill. Archived from the original on 2008-10-05. Retrieved 2009-11-25. ^ Sarju Shah (2009-04-03). "Nintendo DSi Hands-On". GameSpot. CBS Interactive. p. 4. Archived from the original on May 29, 2010. Retrieved 2009-09-25. ^ Douglas Rankine (January 29, 2010). "Nintendo DSi XL review". Wired.co.uk. Condé Nast Publications. Archived from the original on January 5, 2011. Retrieved July 14, 2010. ^ McKinley Noble (2010-03-29). "Nintendo DSi XL (review)". GamePro. IDG. Archived from the original on 2010-08-08. Retrieved 2011-08-18. ^ a b c d Mike Jackson (2009-11-23). "Nintendo DSi XL Review". ComputerAndVideoGames.com. Future plc. Archived from the original on 2010-01-02. Retrieved 2009-11-30. ^ Carol Mangis (2009-03-29). "Nintendo DSi XL Review & Rating". PC Magazine. Ziff Davis. Archived from the original on January 6, 2012. Retrieved 2011-02-06. Nintendo (2009). Nintendo DSi Instruction Manual (PDF). Nintendo Australia. Archived from the original (PDF) on July 6, 2011. Retrieved March 30, 2009. Satoru Iwata (October 2, 2008). "Nintendo Conference Fall 2008". Nintendo. Archived from the original on May 1, 2009. Retrieved November 23, 2008. Wikimedia Commons has media related to Nintendo DSi.